cap is up to 8cm wide, has characteristic honeycomb surface consisting of black/brown ridges and dark brown pits, darkening with age. bottom of cap does not hang loose but is fused to the stem. cap and stem are hollow, and form a single, continuous hollow chamber. taste and odor are mild, pleasant; cook before eating. tip: morels are variable in shape, size and color (white/gray/yellow/green/pink/brown/black), but are characterized by their distinctively convoluted caps that form a single, continuous hollow chamber with the stem. 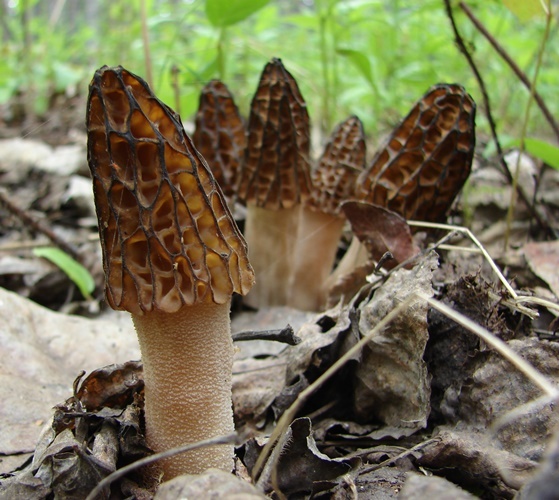 All true morels (species of Morchella) are edible when cooked. warning: morels are poisonous when raw, and should be thoroughly cooked. warning: may be poisonous if consumed with alcohol. warning: do not confuse with the inedible/poisonous false morels, which differ in that the cap and stem do not form a single, continuous hollow chamber.